Another spring. Another strenuous training regiment that began in the fall and persisted through the winter. Another thawing of the River Charles. And yet another series of campaigns for the four Harvard varsity rowing teams. Two weeks into spring competition, all crews have already made a strong impression. The No. 3 men’s heavyweight crew ventured to Cornell, which hugs the southern tip of Cayuga Lake in Ithaca, N.Y., the scene of this weekend’s battle. The Crimson dominated both the No. 12 Big Red as well as No. 15 George Washington, taking all four races, including a dominating finish in the first varsity eight. 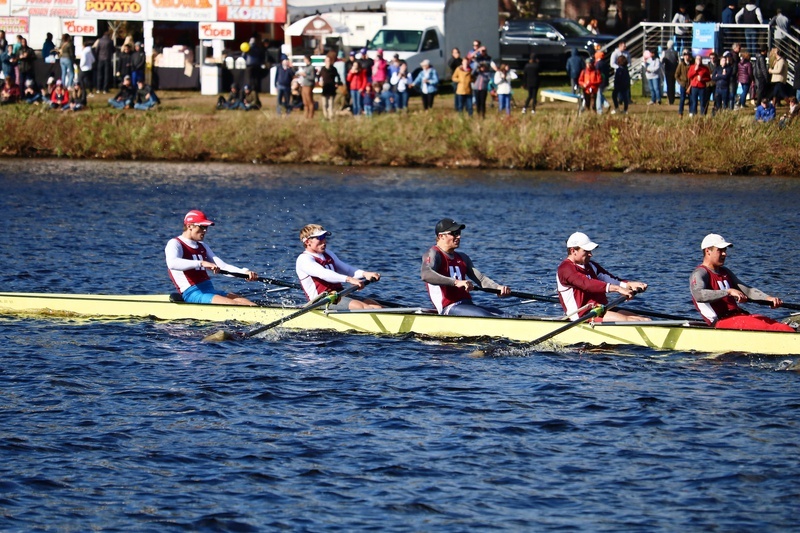 Harvard finished more than nine seconds in front of second-place Cornell, crossing the finish in 5:38.2. Corrigan said that the training that leads up to the races in the spring is tough but fulfilling. The No. 4 Radcliffe lightweight crew hosted No. 3 Princeton on the Charles. The Tigers emerged with a victory, finishing the 1V in 6:50.9 to the Black and White’s 7:01.0 and taking the Class of 1999 Cup in the process. Radcliffe dominated the Tigers in the 3V with a nine-second victory in 7:25.3. Last week, the team took the Class of 2004 Cup from No. 4 Georgetown, edging out the opponent by just over three seconds in the first varsity eight with a time of 6:17.5. Radcliffe looks forward to facing Princeton for the Knecht Cup next weekend. The No. 14 Radcliffe heavyweight crew finished runner up for the Class of 1875 Plaque and Class of 1975 Cup at the Ivy Round Robins at Princeton this weekend. The Black and White finished second in the varsity eight for the Class of 1984 Plaque to Princeton; the Tigers clocked in at 6:25.3 to Radcliffe’s 6:29.0. Princeton also took the Class of 1975 Cup with a time of 6:13.1 to the Black and White’s 6:25.5. Last week, at the Ivy League/Big Ten Double Duals at Michigan, Radcliffe shined on day two of the event, winning the varsity eight in 6:40.8 over second place Indiana in 6:42.5 and taking the second varsity eight with a time of 7:01.4, three seconds faster than second place Michigan State. The No. 5 Men’s Lightweight Crew took the Wales-Kirrane Cup over both No. 3 Columbia and No. 8 Georgetown this weekend at the Lions’ Overpeck Park. Harvard’s 1V finished in 5:42.85 to Columbia’s 5:44.48 and Georgetown’s 5:52.95. 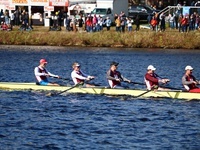 The Crimson also took both the 3V, the 4V, and the 5V4+. The team also won two of four races at the Matthews-Leonard Cup, in which they competed against No. 5 Penn and No. 2 Cornell on the Schuylkill River in Pennsylvania. Harvard finished first in both the 3V and the 4V. Cornell did win the 1V in 5:38.2 to secure the cup. Overall, both Corrigan and Buchan noted how exciting it is to finally get into the swing of racing. All four crews look to race in a smattering of regular season matches before the large regattas of the postseason. Buchan echoed many of these sentiments and particularly emphasized the quality of trust that her team has.